Firstly, I must confess I am running nearly two weeks late with this monthly eNews email. I spent several days in July working on the latest BullCharts software beta testing (version 4), and at the Sydney Future Wealth Forum to help pass on the message to investors and traders that the useful details for sharemarket investments and stock selection are already in the charts (and helping to promote BullCharts software). And some of the discussions in Sydney have influenced the content of this eNews email this month. In the discussions with investors and traders at the 3-day Sydney expo/forum in July, it suddenly dawned on me that over the last almost 6 years while I have accumulated the wealth of material in my Share Market Toolbox (and the 146 eBook Articles) I have not done a complete job of introducing the subject of Technical Analysis, and explaining to the relative newbies exactly how to utilise it, and learn more about it at the same time. So I am starting to rectify that this month with the material referred to here. In the price chart below, note that there are a number of annotations drawn on the chart (eg. text boxes, lines, etc.) - click on this chart image for a larger version. 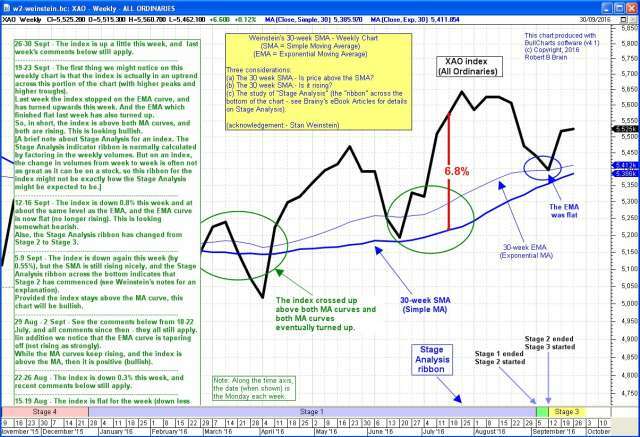 This chart is actually a weekly chart of the All Ordinaries index (XAO), with the 30-week Moving Average chart indicator, and the Weinstein Stage Analysis ribbon across the bottom of the chart (as per Stan Weinstein's ideas). As many Toolbox Members will know, this is one of several charts I maintain and update each week. I add to the running commentary on this chart every Friday night, with my observations for the week just finished. These are added into the top of the text box in the lower portion of this chart. When a technical analyst performs some analysis, we really want to record our observations some where. So, for anyone who is learning how to read the stories in the price charts, and who wants to record observations in a useful location, the information in this eNews email below will be very helpful. For anyone who is on their journey of learning more about Technical Analysis, one challenge is to start practising what they know about the subject. But that is easier said than done because sometimes we have to analyse a price chart, and then wait days or weeks (or even months) to see how accurate the analysis actually was. So we need to easily capture our observations and analysis details. In this month's updated and new eBook PDF Articles (listed below), there are a host of tips and suggestions as to how to go about doing this. 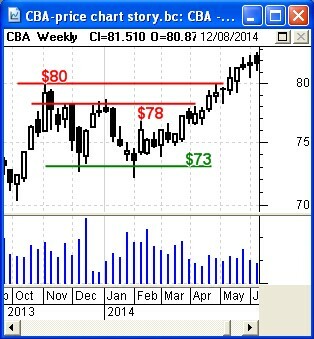 And some of the material focuses on the charting software tool that this analyst uses (BullCharts software). Article TA-1100, "Beginners start here" - This updated (and free for everyone) 4-page eBook Article is a good place for the beginners to technical analysis. It provides a quick overview of the journey ahead. It was first written four years ago, and is now updated. Article TA-1110, "Pulling it all together" - This new (and free) 5-page eBook Article provides some tips and suggestions for how to move forward with studying technical analysis, and practising it at the same time. It mentions that there are many different things that we might observe when we analyse a price chart, and which we might want to record on the chart, or with the chart, for future reference. Article BC-03-100, "Saving chart details - overview" - This updated 4-page eBook Article is now publicly available to everyone and sets the scene to help the reader understand some of the alternative methods for capturing chart analysis observations and comments. 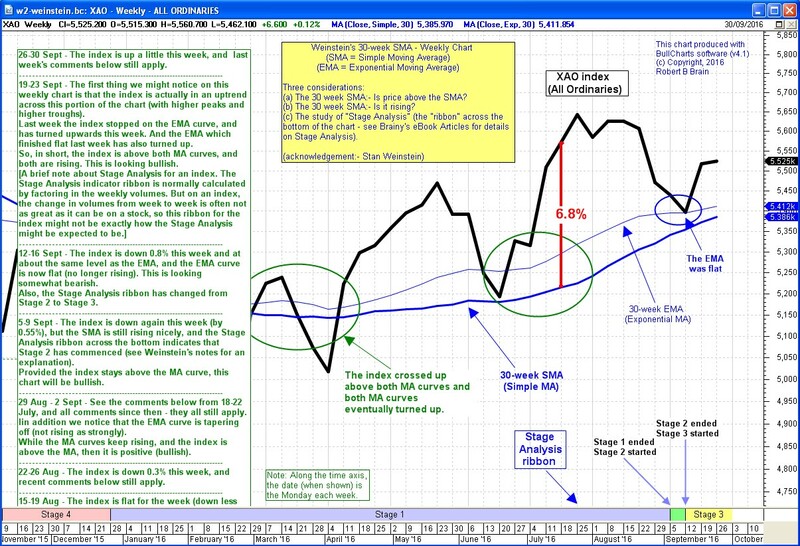 Article BC-03-110, "Saving chart details and annotations" - This brand new 5-page eBook Article goes into some detail and explains how to use BullCharts software to capture your analysis observations for easy reference later. Basically there are a couple of options - using the default IntelliCharts feature to automatically capture chart annotations, or to save the displayed chart as a chart file. Toolbox non-members can see the free page 1.